You may think that the Great Pyramid of Egypt has given up all of its secrets but there are a number of clues and peculiarities that point to a secret door inside the King’s Chamber. In actual fact, another door has to exist because without it, it would have been impossible to seal up. There is a 2 cm difference between the floor levels of the kings chamber and the entrance corridor into it, the latter being lower. Also, the cross-sectional area of the corridor between the Grand Gallery and the portcullis chamber is smaller than that of the corridor between the portcullis chamber and the king’s chamber. So, to put it in basic terms, the block that sealed the King’s chamber could only have been pushed into place from inside of the chamber. The block that sealed the entrance to the king’s chamber therefore never passed through the portcullis chamber. 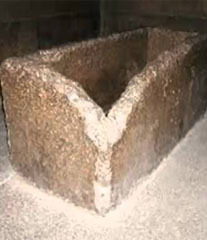 Due to the difference in the floor level, if any thieves reached the back of this block, via the connecting chambers, they would have to smash through it to gain entrance. That’s what happened more than a thousand years ago when Al-Ma’mun broke into the King’s Chamber in 850 AD and until recently the smashed block remained inside the King’s Chamber. Where it is now is anybody’s guess. This crude entrance, believed to be the only one, is the one that tourists now use to enter the King’s Chamber, but evidence suggests that originally it was just an access route, used during its construction, and not the main entrance. After it’s removal from the north wall, the block that covered this access route was placed next to the so-called sarcophagus and next to an area of the King’s Chamber that was dug by Al-Ma’mun. At the west side of the North wall, he and his men dug down, creating a small cavity and this has since been covered over with metal sheeting with a faux-stonework appearance, on which now sits a dehumidifier unit. Al-Ma’mum clearly had a reason to dig in this area, but by all accounts he gave up and apparently found nothing in his search for treasure. But little did he know that although he was in the right area, instead of digging down he should have dug horizontally. Watch the video above and look at the structure of the north wall of the King’s Chamber. The blocks in pink form a doorway that takes the entire weight of the granite ceiling beams. The yellow blocks filling the doorway don’t actually bear on the central block at the bottom, coloured in blue. This block was therefore the final block to go into the wall, sealing it up. The block is free to move without altering the strength of the wall. The discovery was made by the famous French architects, Jean Pierre Houdin. He has analysed the wall in great detail and notes that the first yellow block above the blue is cracked in two places at the centre, proving that there was once a space between the two blocks. If the two blocks had a tight fit, it would not crack in such a manner. By digging the floor in front of the north wall, Al-Ma’mun’s workers may well have caused the wall to move by a few millimetres, which would be enough to crack the yellow block and cause it to rest on the blue block for the first time. Houdin also managed to slide a credit card through the right-hand joint between the blue block and pink block with ease. It is impossible to do this elsewhere. We’ve all heard that the blocks of the Great Pyramid are so precise you can’t even fit a razor blade between them, well, not in this one specific place. He also noticed that the blue block is slightly below the adjacent pink block, which shows that it was put into position at a different time. Interestingly, the sarcophagus lines up directly with the blue block and also fits through the gap that would be created if the blue block was removed. This is clearly how the sarcophagus got into the Kings Chamber, and was therefore unlikely to have been placed into position during the pyramids construction. These new findings mean that it could certainly have been placed into the pyramid at a later date. So what’s behind the door? Houdin, who takes the Egyptological interpretation that the pyramid is Khufu’s tomb, believes there are two antechambers, like we see with the Egyptian Red Pyramid. We also see two cubicles in the Pyramid of Meidum and two continuous rooms in the Bent Pyramid. His logic here certainly makes sense. He believes that these antechambers are funereal apartments, which should contain Pharoah Khufu’s possessions for the next life. Clearly Al Ma’mun never got access to these chambers, and nobody else has since, so the contents of the concealed rooms could well be undisturbed. Egyptian authorities, of course, know everything that is mentioned in this video but have not allowed for further excavation in the Great Pyramid, even though it could provide further proof, if not definitive proof, that the pyramid was Khufu’s tomb. So why don’t they allow it? The answer - because it wasn’t his tomb, and probably wasn’t anybody’s either. I believe the damaged sarcophagus was slid into the King’s chamber through the true entrance once the pyramid was complete to stop any further exploration in future years. 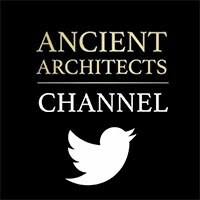 The damaged sarcophagus, which was clearly damaged before the pyramid was sealed due to the nature of the damage, gave the appearance of an already looted tomb – a damaged sarcophagus and empty chambers. The room was then sealed for acoustic reasons, as I mention in my previous video. I have no doubt that the Egyptian authorities already know what lies beyond the true doorway and that is why they choose not to publicly excavate. We know that they have done private examinations in the so-called air or star shafts, and there is reason to believe that there have been secret excavations in the pyramid’s hidden antechambers. In a video on the Pukajay Productions YouTube channel, they show a crude padlocked mesh doorway, just before you enter the King’s Chamber. In Houdin’s model he predicts there should have been an access chamber here – another way to reach the antechambers, and surprise surprise, there is a man-made cavity in the wall in this exact position. It bends around to the left and there isn’t a great deal you can see but it is totally off-limits to the public, and never mentioned by Egyptologists. In fact, the people at Pukajay Productions even asked Zahi Hawass what was behind the door and Hawass totally dismissed them. I believe the doorway is a relatively recent, crude entrance to the antechambers, the secret parts of the pyramid that may well tell the full story of what the pyramid is and who built it and the fact that they haven’t disclosed details leads me to believe the findings were not what they expected. 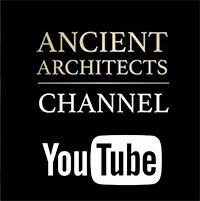 In one of my videos on the Ancient Architects channel, I explained that I believed Egypt’s first pharaoh, Narmer, who reigned at around 3,100 BC, built The Great Pyramid. I believe he, a descendent of the kings of Mesopotamia, built it to be an agricultural machine to pump huge amounts of water into the landscape and halt the desertification of Lower Egypt. And then, the pyramid’s unquestionable acoustic properties would create an electrical field capable of deflecting very low frequencies, which have been proved to stimulate the growth of crops. Maybe I’m way off the mark, or maybe I’m closer than you think, but then again maybe it was just the tomb of King Khufu, as Egyptologists suggest. All I say is, if Egyptologists are so sure, then prove it. You have nothing to lose in publicly excavating the hidden chamber – just think of the headlines it will create and the new interest, intrigue and tourism into Ancient Egypt it will generate! A world renowned architect in Jean Pierre Houdin has proved a chamber is there, so why won’t they publicly investigate it? Because, in my opinion, they already have and they found something they don’t want us to see, and I’m sure it has nothing to do with Pharoah Khufu.